Before the Metro board this month are studies on five Metrolink stations, in Claremont, Commerce, El Monte, Northridge, and potentially serving Rio Hondo College. In addition, the Metro board is expected to approve a study on potential upgrades to Metrolink’s Antelope Valley line. Mostly these studies focus on upgrading Metrolink stations to make them better connected with nearby destinations. 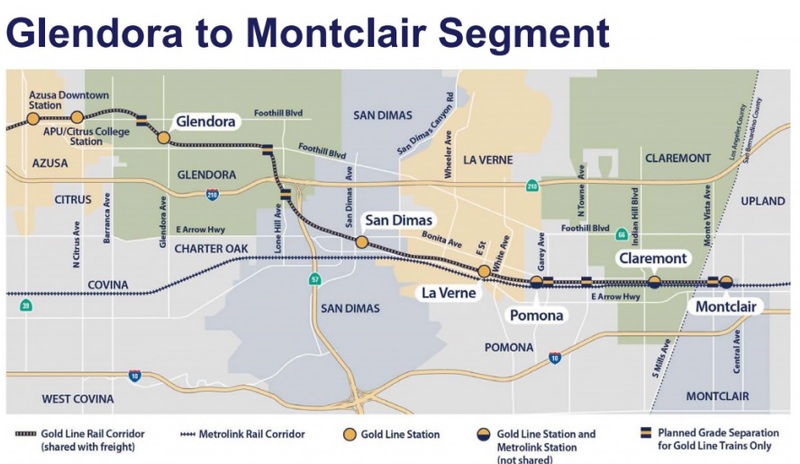 The exception to this is for Claremont, which is part of a larger study on how the future Gold Line extension and parallel Metrolink San Bernardino Line can work together most effectively. At this point, the four Metrolink station projects are not funded, nor do they appear to have a great deal of momentum. The studies are an early step in the political process. If upgrades appear feasible – technically, politically, fiscally – then municipalities and electeds may seek funding to get project work underway. Based on a July motion from Metro boardmembers Catherine Barger and Ara Najarian, Metro plans to study potential improvements to the Metrolink Antelope Valley Line between Burbank and Lancaster. Pending board approval this month, the $500,000 study would be funded by underruns from a recent discounted fare program for that line. Since the Foothill Gold Line was extended to its current terminus in Azusa, boardings at the Covina Metrolink Station have declined 25 percent, and overall Metrolink San Bernardino Line ridership has declined by 7.6 percent. Metro staff presume that much of this decline is Metrolink riders switching to the Gold Line. The attrition could become worse as the Foothill Gold Line is extended east to Montclair. That phase is scheduled to break ground this year, and be completed in 2026. Right now the nearest Gold Line and Metrolink stations are four miles apart. After the next phase is built, both the Gold Line and Metrolink will operate in the same rail right-of-way where the Metrolink San Bernardino Line currently runs. This month the Metro board was expected to approve $750,000 for a study “to develop strategies that would enable [Gold Line and Metrolink San Bernardino Line services] to complement each other. A substitute motion by Supervisor Hilda Solis, focused Metro’s efforts on evaluating the possibility of eliminating the city of Claremont’s Metrolink station. Due to the right-of-way constraints, extending the Gold Line is now expected to demolish the existing Claremont platform, and to rebuild it at a different nearby location. This rebuild increases the cost of the Gold Line project, so some have questioned the need for the Claremont Metrolink station, especially given its location roughly a mile from the existing Montclair Metrolink Station. Though Claremont residents could access nearby Metrolink stations by bicycling, driving, or taking the Gold Line, the possibility of eliminating the Claremont Metrolink Station does not sit well with Claremont leadership. If approved by the Metro board this month, the Claremont Metrolink station evaluation should return to the board in 60 days. 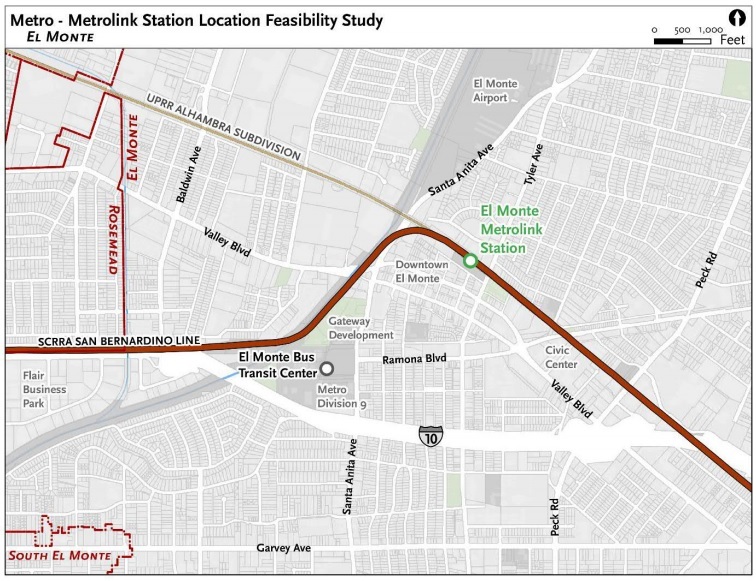 This month the Metro Planning and Programming Committee received a feasibility study examining possibilities for relocating the existing El Monte Metrolink Station. El Monte’s station, on the Metrolink San Bernardino Line, is located about a mile northeast of the El Monte Bus Transit Center, a major hub for San Gabriel Valley bus service, including the Silver Line BRT. 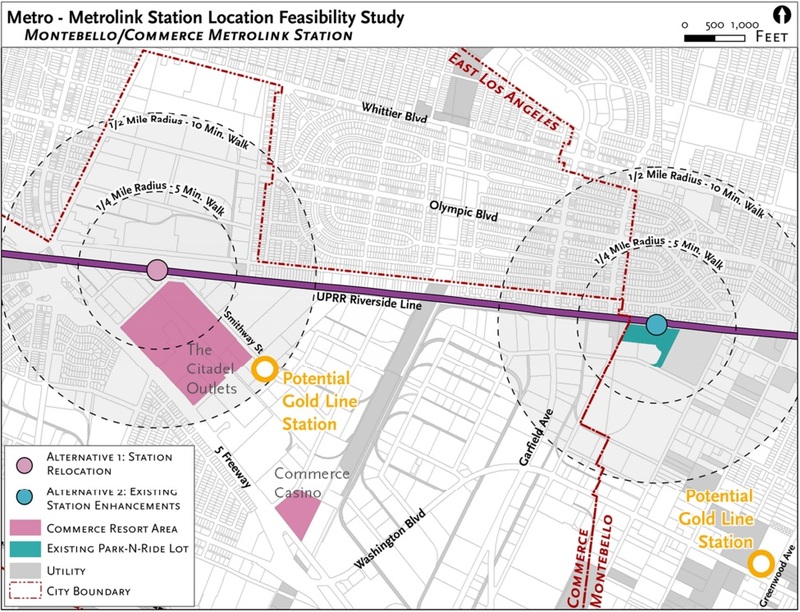 This month the Metro Planning and Programming Committee received a feasibility study examining possibilities for relocating the existing Montebello/Commerce Metrolink Station closer to the Citadel. The city of Commerce is planning to expand the Citadel Outlets, Commerce Casino, and surrounding hotels. The existing Montebello/Commerce Metrolink Riverside Line station is approximately 1.5-miles east of the Citadel. The Riverside Line operates infrequently, with 411 daily Montebello/Commerce boardings on 12 trains each weekday, and no weekend service. Commerce is also served by a separate Metrolink Orange County Line station, about 2.5 miles south of the Citadel. 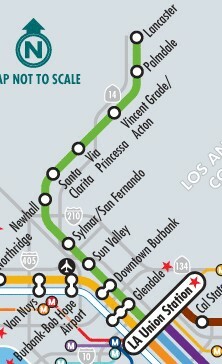 In the future the area would be served by a planned Eastside Gold Line extension. Relocating the existing Montebello/Commerce station is difficult as it would require UPRR approval. 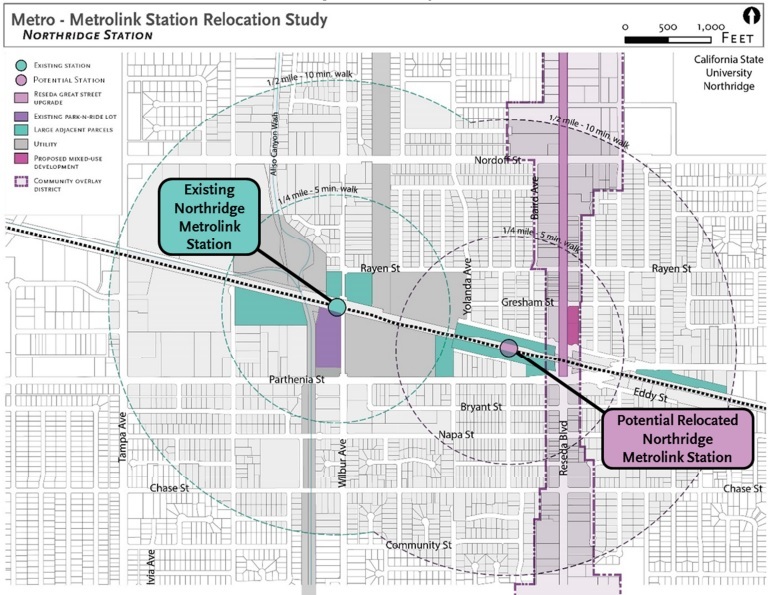 This month the Metro Planning and Programming Committee received a feasibility study examining possibilities for relocating the existing Northridge Metrolink station, in order to be closer to California State University at Northridge (CSUN). As the crow flies, the existing station is a half-mile from the CSUN campus, but station access is oriented to the south so the only way to get from the station to the campus is a circuitous route that is nearly double that. The Northridge station, including a 300-space surface parking lot, is owned and operated by LADOT, which reports that the site currently experiences problems with vandalism and homeless encampments. The study examined possibilities for relocating the station to be adjacent to Reseda Boulevard, where it would be roughly a quarter-mile walk or ride from campus, nearly all along Reseda Boulevard’s protected bike lanes. The study also looked into potential transit-oriented development at each of the sites. The cost estimates do not include potential TOD at either site. 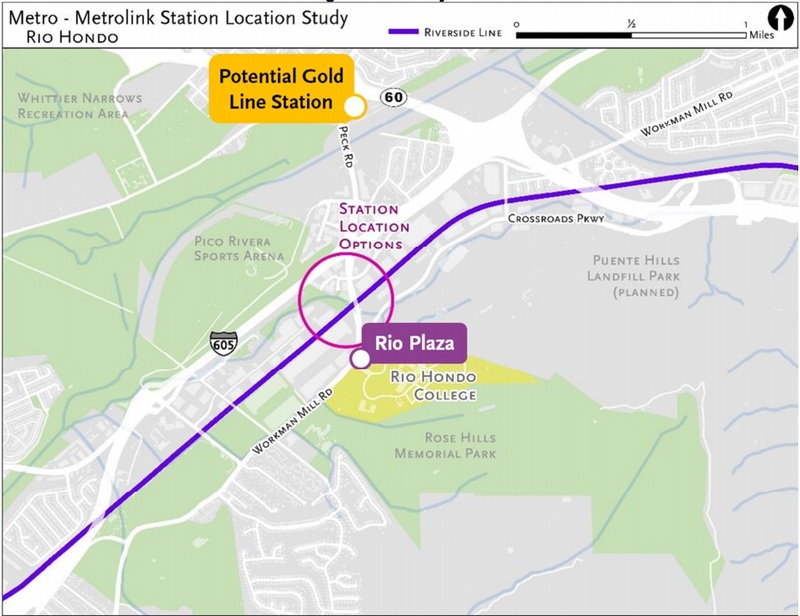 This month the Metro Planning and Programming Committee received a feasibility study examining possibilities for adding a new Rio Hondo College station on the Metrolink Riverside Line. The station would be complicated as the current arrangements with UPRR allow for only six stations on this line, so this would need to be renegotiated and mitigated, or another station would need to be eliminated. might it be possible to install bike racks at these stations ? I use Metrolink and I hate them so much. This shouldn’t be this hard. Quite honestly, it’s long past time to renegotiate the UPRR contract anyway to add more daily departures and at least think about weekend service, so if adding the Rio Hondo College station is the catalyst for that, so be it. Why bother wasting 80 million dollars on relocating The Montebello/ Commerce station. There’s a free, easy and little used shuttle from Union Station that takes you to the Casino and Outlets and there’s a Gold Line Station planned there. Use the money to prop up those services. I hope they don’t get rid of the Gold Line Claremont station. Even with more stops the Gold Line is a much better service than that that sorry excuse for a commuter rail system called Metrolink. I’ve experienced nothing but trouble whenever I’ve taken it. Maybe not everyone is coming from West LA. It’s also possible that he 30 minute average time is just a little too much for people, particularly if you have to add time on the Riverside line into LA and then transfer and wait for a bus that comes hourly. The Gold line might not be built down there till the late 2050s if at all. Even if it does, but that point more people might be coming in from the east side of the region and want to transfer onto the gold line, rather than having to head all the way into Union Station and then transferring.